ReVision, a word with origins in the mid16th century, has been co-opted and rebranded. To ReVision is not simply to revise something, it is to see the object/concept/idea new again. It is with a fresh look at the ordinary that architects and inventors alike are able to create the extraordinary. Asphalt roofing shingles are a great example of an object that has recently been ReVisioned. Companies like CertainTeed and Dow Building Solutions have ReVisioned the asphalt shingle by marrying it to solar panels to create the photovoltaic shingle. Gone are the days of unseemly photovoltaic panels that resemble a 1960’s drawing of the future. No longer does solar energy belong to either the wealthy elite or the Sci-Fi film. Solar shingles are simply the result of traditional products being revolutionized, making solar energy more accessible to the average homeowner by creating solar collectors that integrate seamlessly with the typical asphalt shingle. 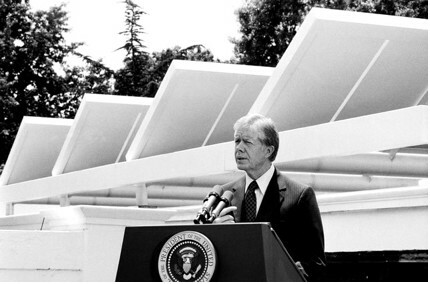 President Jimmy Carter's Solar Panels, featured here, represent the past of solar energy. Perhaps President Reagan wouldn't have objected to a few solar shingles. (Photo Courtesy of whitehousemuseum.org). ReVisioning is simply a kind of product development, where BPMs are applying new technology to existing products to create not only a new product, but a new product category as well. Photovoltaic shingles are an example of how ReVisioning can allow you to tap into new market opportunities. Plus, with pressure on all of us to live in a more sustainable way, ReVisioning gives us a chance to rethink the way our products functioned before, and discover how eco-friendliness can apply to products never before possible through new technology.